A SINGLE CLUSTER OF DISEASES :- Heart, Hypertension, Diabetes and Lipids (HDL) are a cluster of diseases that invariably occur together. When one disease starts, the others usually join in. Together this cluster is called either as Metabolic Syndrome (or) Syndrome-X (or) Life Style Disorders. The treatment of these diseases (especially Diabetes) have been largely streamlined and most physicians follow the same well-laid international protocol to treat it. But preventing the complications of Diabetes Mellitus - like sudden heart attacks, kidney failure, brain stroke, gangrene, neuropathy and gastropathy needs a more advanced prevention protocol. Dr.JP's Cardio-Diabetic Clinic at Aditya Hospital is a much sought after 'prevention clinic'. It not only treats Diabetes but also prevents and treats all its complications. 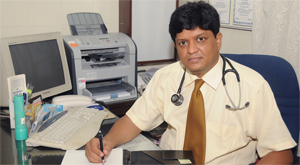 Dr.R.Jayaprakash, who runs this clinic has a degree in Diabetes, Medicine and Critical care. He earlier worked as Registrar in Cardiology at a Cardiac Hospital and also as Preventive Cardiologist at Apollo Hospitals. The clinic offers the "Cardio-Nephro-Diabetic (CND) Checkup" which is a huge hit amongst patients who suffer from Diabetes, High Blood Pressure, Stress and Cholesterol. The CND check-up can predict cardiac and renal complications long before it actually happens and helps us to prevent it. The life-style modification program offered by Dr.JP's Cardio-Diabetic Clinic has shown excellent results. But on the other side of the spectrum, when complications do occur, we have all the ICU & Surgical resources needed to tackle that too. Hence, this clinic offers you - A to Z cover.